This article is about the Greek geographer. For other people called "Strabo", see Strabo (disambiguation). Strabo[n 1] (/ˈstreɪboʊ/; Greek: Στράβων Strábōn; 64 or 63 BC – c. AD 24) was a Greek geographer, philosopher, and historian who lived in Asia Minor during the transitional period of the Roman Republic into the Roman Empire. Strabo was born to an affluent family from Amaseia in Pontus (in present-day Turkey) in around 64 BC. His family had been involved in politics since at least the reign of Mithridates V. Strabo was related to Dorylaeus on his mother's side. Several other family members, including his paternal grandfather had served Mithridates VI during the Mithridatic Wars. As the war drew to a close, Strabo's grandfather had turned several Pontic fortresses over to the Romans. Strabo wrote that "great promises were made in exchange for these services", and as Persian culture endured in Amasia even after Mithridates and Tigranes were defeated, scholars have speculated about how the family's support for Rome might have affected their position in the local community, and whether they might have been granted Roman citizenship as a reward. Strabo's life was characterized by extensive travels. He journeyed to Egypt and Kush, as far west as coastal Tuscany and as far south as Ethiopia in addition to his travels in Asia Minor and the time he spent in Rome. Travel throughout the Mediterranean and Near East, especially for scholarly purposes, was popular during this era and was facilitated by the relative peace enjoyed throughout the reign of Augustus (27 BC – AD 14). He moved to Rome in 44 BC, and stayed there, studying and writing, until at least 31 BC. In 29 BC, on his way to Corinth (where Augustus was at the time), he visited the island of Gyaros in the Aegean Sea. Around 25 BC, he sailed up the Nile until reaching Philae,[n 2] after which point there is little record of his proceedings until AD 17. It is not known precisely when Strabo's Geography was written, though comments within the work itself place the finished version within the reign of Emperor Tiberius. Some place its first drafts around 7 BC, others around AD 17 or 18. The latest passage to which a date can be assigned is his reference to the death in AD 23 of Juba II, king of Maurousia (Mauretania), who is said to have died "just recently". He probably worked on the Geography for many years and revised it steadily, not always consistently. It is an encyclopaedical chronicle and consists of political, economic, social, cultural, geographic description of almost whole Europe: British Isles, Iberian Peninsula, Gaul, Germania, The Alps, Italy, Greece; and Northern Black Sea region, Anatolia, Middle East, Central Asia and North Africa. The Geography is the only extant work providing information about both Greek and Roman peoples and countries during the reign of Augustus. On the presumption that "recently" means within a year, Strabo stopped writing that year or the next (AD 24 ), when he died. He was influenced by Homer, Hecataeus, and Aristotle. The first of Strabo's major works, Historical Sketches (Historica hypomnemata), written while he was in Rome (c. 20 BC), is nearly completely lost. Meant to cover the history of the known world from the conquest of Greece by the Romans, Strabo quotes it himself and other classical authors mention that it existed, although the only surviving document is a fragment of papyrus now in possession of the University of Milan (renumbered [Papyrus] 46). At around the age of 21, Strabo moved to Rome, where he studied philosophy with the Peripatetic Xenarchus, a highly respected tutor in Augustus's court. Despite Xenarchus's Aristotelian leanings, Strabo later gives evidence to have formed his own Stoic inclinations. [n 6] In Rome, he also learned grammar under the rich and famous scholar Tyrannion of Amisus. [n 7] Although Tyrannion was also a Peripatetic, he was more relevantly a respected authority on geography, a fact obviously significant, considering Strabo's future contributions to the field. The final noteworthy mentor to Strabo was Athenodorus Cananites, a philosopher who had spent his life since 44 BC in Rome forging relationships with the Roman elite. Athenodorus endowed to Strabo three important items: his philosophy, his knowledge, and his contacts. Unlike the Aristotelian Xenarchus and Tyrannion who preceded him in teaching Strabo, Athenodorus was Stoic in mindset, almost certainly the source of Strabo's diversion from the philosophy of his former mentors. Moreover, from his own first-hand experience, Athenodorus provided Strabo with information about regions of the empire which he would not otherwise have known. Strabo is most notable for his work Geographica ("Geography"), which presented a descriptive history of people and places from different regions of the world known to his era. Although the Geographica was rarely utilized in its contemporary antiquity, a multitude of copies survived throughout the Byzantine Empire. It first appeared in Western Europe in Rome as a Latin translation issued around 1469. The first Greek edition was published in 1516 in Venice. 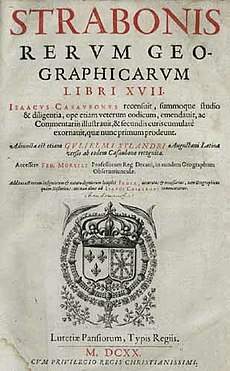 Isaac Casaubon, classical scholar and editor of Greek texts, provided the first critical edition in 1587. 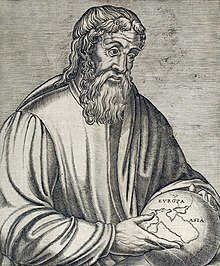 Although Strabo cited the antique Greek astronomers Eratosthenes and Hipparchus, acknowledging their astronomical and mathematical efforts towards geography, he claimed that a descriptive approach was more practical, such that his works were designed for statesmen who were more anthropologically than numerically concerned with the character of countries and regions. As such, Geographica provides a valuable source of information on the ancient world, especially when this information is corroborated by other sources. He traveled extensively, as he says: "Westward I have journeyed to the parts of Etruria opposite Sardinia; towards the south from the Euxine to the borders of Ethiopia; and perhaps not one of those who have written geographies has visited more places than I have between those limits." We do not know when he wrote Geographica, but we know that he spent a lot of time in the famous library taking notes from his sources and his "the works of his predecessors" are most likely to have been noted at the library there. A first edition was published in 7 BC and a final edition no later than 23 AD, in the last year of Strabo's life. Geographica, unfortunately, had an infinitesimal influence in his lifetime. It took about five years for scholars to give him a credit and for it to become a standard. In his last book of Geographica, he wrote quite extensively about the thriving port city of Alexandria. He emphasized that the harbor was well-encompassed by the embankments and that the shore was so deep-watered that even the largest ships could traverse. These ships were sent out to India, Ethiopia to supply them with products. Strabo juxtaposes Dichaiarchia (Naples, one of the largest ports in Europe) and Alexandria ports and says that the ships in Alexandria were clearly bigger. Thus, freight transporting and shipping were essential to foreign trade in products from all over the world, suggesting a highly developed local economy at that time. Strabo also describes the city itself. According to him, there were a lot of beautiful public parks and the city was reticulated with perfectly designed streets that were wide enough for chariots and horsemen. "Two of these are exceeding broad, over a plethron in breadth, and cut one another at right angles ... All the buildings are connected one with another, and these also with what are beyond it." Hence, the architecture was also developed in Egypt. Strabo is pro-Roman politically, but culturally he reserves primacy to Greece: "... pro-Roman throughout the Geography. But while he acknowledges and even praises Roman ascendancy in the political and military sphere, he also makes a significant effort to establish Greek primacy over Rome in other contexts." In India, Strabo described small flying reptiles that were 90 centimetres (35 in) long with a snake-like body and bat-like wings. Other historians, such as Herodotus, Aristotle, and Flavius Josephus, mentioned similar creatures. Strabo... enters largely, in the Second Book of his Geography, into the opinions of Eratosthenes and other Greeks on one of the most difficult problems in geology, viz., by what causes marine shells came to be plentifully buried in the earth at such great elevations and distances from the sea. He notices, amongst others, the explanation of Xanthus the Lydian, who said that the seas had once been more extensive, and that they had afterwards been partially dried up, as in his own time many lakes, rivers, and wells in Asia had failed during a season of drought. 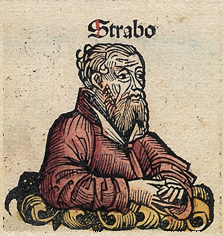 Treating this conjecture with merited disregard, Strabo passes on to the hypothesis of Strato, the natural philosopher, who had observed that the quantity of mud brought down by rivers into the Euxine was so great, that its bed must be gradually raised, while the rivers still continued to pour in an undiminished quantity of water. 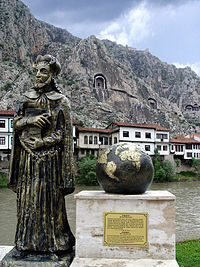 He therefore conceived that, originally, when the Euxine was an inland sea, its level had by this means become so much elevated that it burst its barrier near Byzantium, and formed a communication with the Propontis, and this partial drainage had already, he supposed, converted the left side into marshy ground, and that, at last, the whole would be choked up with soil. So, it was argued, the Mediterranean had once opened a passage for itself by the Columns of Hercules into the Atlantic, and perhaps the abundance of sea-shells in Africa, near the Temple of Jupiter Ammon, might also be the deposit of some former inland sea, which had at length forced a passage and escaped. In another place, this learned geographer [Strabo], in alluding to the tradition that Sicily had been separated by a convulsion from Italy, remarks, that at present the land near the sea in those parts was rarely shaken by earthquakes, since there were now open orifices whereby fire and ignited matters and waters escaped; but formerly, when the volcanoes of Etna, the Lipari Islands, Ischia, and others, were closed up, the imprisoned fire and wind might have produced far more vehement movements. The doctrine, therefore, that volcanoes are safety valves, and that the subterranean convulsions are probably most violent when first the volcanic energy shifts itself to a new quarter, is not modern. The very first written definition/discussion on the fossil formation (mentioning Nummulite quoted from A.M. Celâl Şengör). "One extraordinary thing which I saw at the pyramids must not be omitted. Heaps of stones from the quarries lie in front of the pyramids. Among these are found pieces which in shape and size resemble lentils. Some contain substances like grains half peeled. These, it is said, are the remnants of the workmen's food converted into stone; which is not probable. For at home in our country (Amasia), there is a long hill in a plain, which abounds with pebbles of a porus stone, resembling lentils. The pebbles of the sea-shore and of rivers suggest somewhat of the same difficulty [respecting their origin]; some explanation may indeed be found in the motion [to which these are subject] in flowing waters, but the investigation of the above fact presents more difficulty. I have said elsewhere, that in sight of the pyramids, on the other side in Arabia, and near the stone quarries from which they are built, is a very rocky mountain, called the Trojan mountain; beneath it there are caves, and near the caves and the river a village called Troy, an ancient settlement of the captive Trojans who had accompanied Menelaus and settled there." "... There are no trees here, but only the vineyards where they produce the Katakekaumene wines which are by no means inferior from any of the wines famous for their quality. The soil is covered with ashes, and black in color as if the mountainous and rocky country was made up of fires. Some assume that these ashes were the result of thunderbolts and sub-terranean explosions, and do not doubt that the legendary story of Typhon takes place in this region. Ksanthos adds that the king of this region was a man called Arimus. However, it is not reasonable to accept that the whole country was burned down at a time as a result of such an event rather than as a result of a fire bursting from underground whose source has now died out. Three pits are called "Physas" and separated by forty stadia from each other. Above these pits, there are hills formed by the hot masses burst out from the ground as estimated by a logical reasoning. Such type of soil is very convenient for viniculture, just like the Katanasoil which is covered with ashes and where the best wines are still produced abundantly. Some writers concluded by looking at these places that there is a good reason for calling Dionysus by the name ("Phrygenes")." Meineke, Augustus, ed. (1877). Strabonis Geographica. Lipsiae: B.G. Teubneri. Strabo (1852). Gustav Kramer (ed.). Strabonis Geographica. Recens. G. Kramer. Ed. minor. Stefan Radt, ed. (2002–2011). Strabons Geographika : mit Übersetzung und Kommentar. Göttingen: Vandenhoeck & Ruprecht. Jones, H. L., transl. (1917). The Geography of Strabo. Vol. 1 (Books 1 & 2) of 8 vols. London: Heinemann. ^ Strabo (meaning "squinty", as in strabismus) was a term employed by the Romans for anyone whose eyes were distorted or deformed. The father of Pompey was called "Pompeius Strabo". A native of Sicily so clear-sighted that he could see things at great distance as if they were nearby was also called "Strabo." ^ Accompanied by prefect of Egypt Aelius Gallus, who had been sent on a military mission to Arabia. ^ He mentions all or most of his teachers as prominent citizens of their own respective cities. ^ This also highlights the international trend of the era that Greek intellectuals would often instruct the Roman elite. ^ Aristodemus was also the grandson of the famous Posidonius, whose influence is manifest in Strabo's Geography. ^ Largely due to his future teacher Athenodorus, tutor of Augustus. ^ Thus completing his traditional Greek aristocratic education in rhetoric, grammar, and philosophy. Tyrannion was known to have befriended Cicero and taught his nephew, Quintus. ^ Purcell, Nicholas (2014). "Strabo". In Hornblower, Simon; Spawforth, Antony; Eidinow, Esther (eds.). The Oxford Companion to Classical Civilization. Oxford University Press. p. 757. ISBN 978-0-19-870677-9. ^ a b Bianchetti, Serena; Cataudella, Michele; Gehrke, Hans-Joachim (4 December 2015). Brill's Companion to Ancient Geography: The Inhabited World in Greek and Roman Tradition. Leiden: Brill. ISBN 978-90-04-28471-5. ^ Adrienne Mayor (March 2011). The Poison King: The Life and Legend of Mithradates, Rome's Deadliest Enemy. Princeton University Press. pp. 9–. ISBN 0-691-15026-5. ^ a b Strabo (1917). Geography. Vol. I. Translated by Horace Leonard Jones. London: William Heinemann. p. xxv-xxvi. ^ Sarah Pothecary, When was the Geography written? ^ a b c Strabo (1949). "34". Geography. Vol. VIII Book XVII. Translated by Horace Leonard Jones. London: William Heinemann. p. 95. ^ "Strabo, Geography, Volume I: Books 1-2". Loeb Classical Library. n.d. Retrieved 8 September 2018. ^ Geographie, Band 1, Strabo, S.17, Strabo, Karl Kärcher, Gottlieb Lukas Friedrich Tafel, Christian Nathanael Osiander, Gustav Schwab, Verlag Metzler, 1831. ^ Davis, William Stearns (1912). Reading in Ancient History:. Vol. I: Greece and the East. Boston: Allyn and Bacon. pp. 325–329. ^ Kim, Lawrence (2010). Homer between History and Fiction in Imperial Greek Literature. Cambridge University Press. p. 83. ISBN 978-1-139-49024-5. ^ Lyell, Charles (1832). Principles of Geology. John Murray. pp. 20–21. ^ Strabo (1950). "11". Geography. Vol. VI Book XIII. Translated by Horace Leonard Jones. London: William Heinemann. p. 183. "Strabo". Encyclopædia Britannica (15th ed.). 1998. pp. 296–297. Diller, A. (1975). 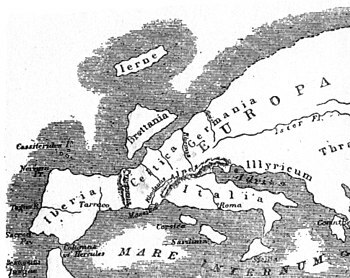 The Textual Tradition of Strabo’s Geography. Amsterdam. Dueck, Daniela (2000). Strabo of Amasia: Greek Man of Letters in Augustan Rome. New York: Routledge. Dueck, D.; H. Lindsay; S. Pothecary, eds. (2005). Strabo's Cultural Geography: The Making of a Kolossourgia. Cambridge: Cambridge University Press. Lindberg, David C. (2008). The Beginnings of Western Science The European Scientific Tradition in Philosophical, Religious, and Institutional Context, Prehistory A.D. 1450 (2nd ed.). Chicago: University of Chicago Press. Roller, Duane (2014). The Geography of Strabo: An English Translation, with Introduction and Notes. Cambridge. Bowersock, Glen W. 2005. "La patria di Strabone." In Strabone e l’Asia Minore. Edited by Anna Maria Biraschi and Giovanni Salmieri, 15–23. Studi di Storia e di Storiografia. Göttingen, Germany: Edizione Scientifiche Italiane. Braund, David. 2006. "Greek Geography and Roman Empire: The Transformation of Tradition in Strabo’s Euxine." In Strabo’s Cultural Geography: The Making of a Kolossourgia. Edited by Daniela Dueck, Hugh Lindsay, and Sarah Pothecary, 216–234. Cambridge, UK: Cambridge Univ. Press. Clarke, Katherine. 1997. "In Search of the Author of Strabo’s Geography." Journal of Roman Studies 87:92–110. Diller, Aubrey. 1975. The Textual Tradition of Strabo’s Geography. Amsterdam: Hakkert. Irby, Georgia L. 2012. "Mapping the World: Greek Initiatives from Homer to Eratosthenes." In Ancient Perspectives: Maps and their Place in Mesopotamia, Egypt, Greece, and Rome. Edited by Richard J. A. Talbert, 81–107. Kenneth Nebenzahl Jr. Lectures in the History of Cartography. Chicago: Univ. of Chicago Press. Kim, Lawrence. 2007. "The Portrait of Homer in Strabo’s Geography." Classical Philology 102.4: 363–388. Kuin, Inger N.I. 2017. "Rewriting Family History: Strabo and the Mithridatic Wars." Phoenix 71.1-2: 102-118. Pfuntner, Laura. 2017. "Death and Birth in the Urban Landscape: Strabo on Troy and Rome." Classical Antiquity 36.1: 33-51. Richards, G. C. 1941. "Strabo: The Anatolian who Failed of Roman Recognition." Greece and Rome 10.29: 79–90.